Flow cytometric analysis of MCF7 cells (blue) and HeLa cells (green) using p16 INK4A (D7C1M) Rabbit mAb (Alexa Fluor® 647 Conjugate) (solid lines) or a concentration-matched Rabbit (DA1E) mAb IgG XP® Isotype Control (Alexa Fluor® 647 Conjugate) #2985 (dashed lines). 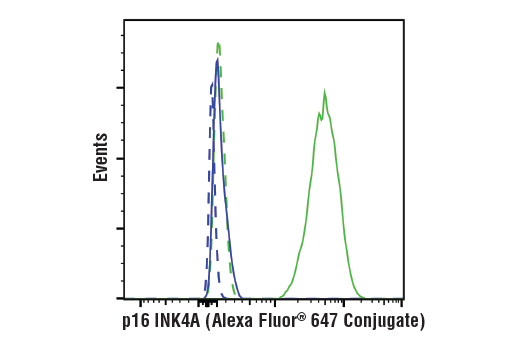 p16 INK4A (D7C1M) Rabbit mAb (Alexa Fluor® 647 Conjugate) recognizes endogenous levels of total p16 INK4A protein. This antibody does not cross-react with p15 INK4B. This antibody is not recommended for use in immunohistochemistry. Monoclonal antibody is produced by immunizing animals with a synthetic peptide corresponding to residues surrounding Ala143 of human p16 INK4A protein. This Cell Signaling Technology antibody is conjugated to Alexa Fluor® 647 fluorescent dye and tested in-house for direct flow cytometric analysis in human cells. This antibody is expected to exhibit the same species cross-reactivity as the unconjugated p16 INK4A (D7C1M) Rabbit mAb #80772. Members of the INK4 family of cyclin dependent kinase inhibitors include p16INK4A, p15INK4B, p18INK4C and p19INK4D. The INK4 family members inhibit cyclin dependent kinases 4 and 6 (CDK4 and CDK6), causing cell cycle arrest in G1 phase. The INK4A-ARF-INK4B locus on chromosome 9p21, frequently lost in human cancer, encodes the INK4 family members p16INK5A and p15INK4B, as well as the unrelated protein, ARF (1). p16 INK4A expression, typically repressed in the absence of stress, is thought to drive cells into senescence, and p16 INK4A expression is a commonly used marker of senescent cells (2). p16INK4A protein expression is often altered in human cancer (3,4), and high expression is currently used as a predictive biomarker in cervical cancer (5). Kim, W.Y. and Sharpless, N.E. (2006) Cell 127, 265-75. LaPak, K.M. and Burd, C.E. (2014) Mol Cancer Res 12, 167-83. Ishikawa, M. et al. Int J Gynecol Cancer 16, 347-53. Queiroz, C. et al. (2006) Pathol Res Pract 202, 77-83. Romagosa, C. et al. (2011) Oncogene 30, 2087-97.